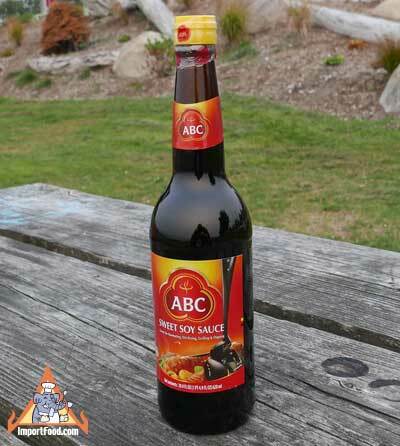 Kecap manis (Indonesian sweet soy sauce), also known as ketjap manis, is a thick soy sauce sweetened with palm sugar. The sauce is very thick (like molasses) and dark in color. Traditionally it's used to flavor various hot and cold Indonesian dishes and is used as a condiment and marinade. We like it in this recipe: Kacang Panjang Kecap, Long Beans in Sweet Soy. Checkout this story in Fine Cooking, (see below) they demonstrate how Kecap Manis is used to make sweet and sour pork sandwich, baby back ribs, cold soba noodles, stir-fried baby bok choy, glazed striped bass, egg fried rice, and kecap manis burgers. Fine Cooking recommends ImportFood.com for kecap manis. Our customer Mark from Waterbury CT sent this recipe to us via email: "Tenderize skirt steak with a mallet that has those sharp little spikes. Then you place in a container with the kecap manis and some fresh grated ginger overnight. Then grill over high heat for 2 minutes on each side to carmelize the outside. If you like it more well-done then cook it at medium heat to taste. Everyone I have had taste it is bugging me for the sauce so I decided to order a bunch as gifts." Ingredients: palm sugar, water, salt, soya bean, wheat, sodium benzoate (0.01%). The finest quality, ABC Brand, well-known in Indonesia. Packed in a nice thick glass bottle. This recipe uses Thai and Indonesian ingredients, the results are fantastic. The best barbeque ribs we've ever made, thanks to the sauce which is added to the ribs at the end of cooking, then on the side as a dip. Just four ingredients make up the sauce, so this is a very simple recipe! The recipe is featured in the July 2010 Fine Cooking Magazine, and ImportFood.com is the recommended supplier of kecap manis.